Father’s Day is a wonderful time to celebrate and honor devoted dads of every species. Just like their human counterparts, there are some males in the animal world that play a vital role in raising and teaching their offspring. As we prepare to sing paternal praises this Father’s Day, let us not forget that even in the animal kingdom, there are really some superb dads that do whatever it takes to ensure the survival of their offspring. Being a dutiful dad does have its evolutionary advantages. By boosting one’s offspring’s odds of survival, fathers can help to ensure that their genes get passed on to the next generation—and the next. From the pregnant papas to the ferocious fathers – these incredible animals take parenting seriously & always step-up when it comes to taking care of their kids. So, in no particular order, here is our salute to the animal kingdom’s most devoted dads. 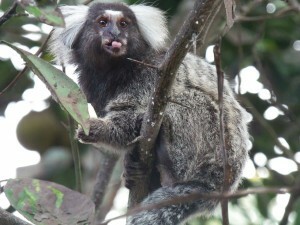 Male Marmosets in South Americaare one of the best animal dads in the animal kingdom. Scientists believe that Marmoset dads are wired this way because of the high cost of birth for the mother. Baby marmosets are typically 25% of the mother’s body weight which can make giving birth a matter of life and death. Pregnancy and giving birth is an energy-sapping process for mama marmosets, so dad’s involvement is crucial to the offspring’s survival. They not only carry, feed and groom their twin babies, they actually act as midwives during the delivery by grooming and cleaning the newborns. If that isn’t sweet enough, consider this: After his babies are born, a marmoset daddy doesn’t look twice at another female. Studies have shown that male marmosets are serious family guys! Seahorses are some of the most fascinating animal dads which is why they always make it to the top of the list for Father’s Day. 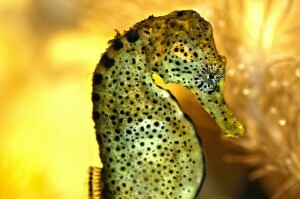 A male seahorse may be the ultimate catch. They not only get pregnant, brooding eggs in their pouch, but they’re monogamous which means that they mate for life. Here’s how it works: The male seahorse will woo his love with an integral dance resulting in them intertwining their tails. The female actually sends the eggs through a tube into a pouch. Inside the pouch, the male fertilizes the eggs and keeps them snug for two to three weeks, depending on the species. And like any good daddy, he monitors the salt levels inside his pouch to ensure they match the surrounding environment to keep the baby seahorses healthy. Male seahorses can carry up to an incredible 2000 babies during his 25 day long pregnancy! Daddy seahorses will proudly display their growing tummy’s to each other until they give birth to their baby seahorses. The Giant water bug is yet another amazing dad that stands out in the animal kingdom. Giant water bugs, also known as toe-biters and alligator ticks, are not pleasant company due to their painful bite. But father water bugs are dedicated to their offspring. The female water bug will cement her fertilized eggs onto the male’s back with a natural and mysterious super glue. This could be as many as 150 eggs. Over the next 21 days, the male becomes a very effective dad, protecting the eggs from predators and periodically exposing them to air to prevent them from growing mold. When the eggs hatch, the father water bug takes full responsibility of looking after the hundred or so young ones until they are ready to go out on their own. One surprising animal that makes it into the running for Father of the Year is the South American Greater Rhea bird. For most birds, the mothers are responsible for handling the child care, but the Rhea bird is exactly the opposite. 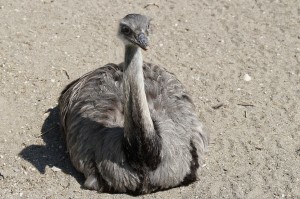 The male Rhea bird is responsible for creating a nest which is filled with the eggs of several different female Rhea’s. After laying their eggs, the mother Rhea’s move on & the dedicated dad stays with his nest to maintain and incubate the eggs over a 42 day period. After the babies hatch, papa Rhea devotes all of his time to take personal care of the 50 or so hatched young ones. The Rhea father is known for being very protective of his young — and at 88 pounds and about 5 feet in height, he makes a formidable bodyguard. Scientists believe the parenting roles of this species are switched due to the mothers putting such a huge investment into laying the extremely large eggs leaving the rest of the parenting responsibility to be taken over by the father. 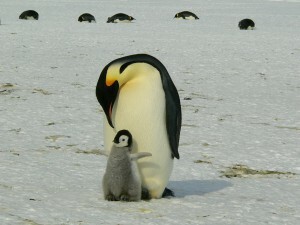 Penguin dads are extremely hands-on (or should that be ‘wings-on?’) in caring for their chicks. 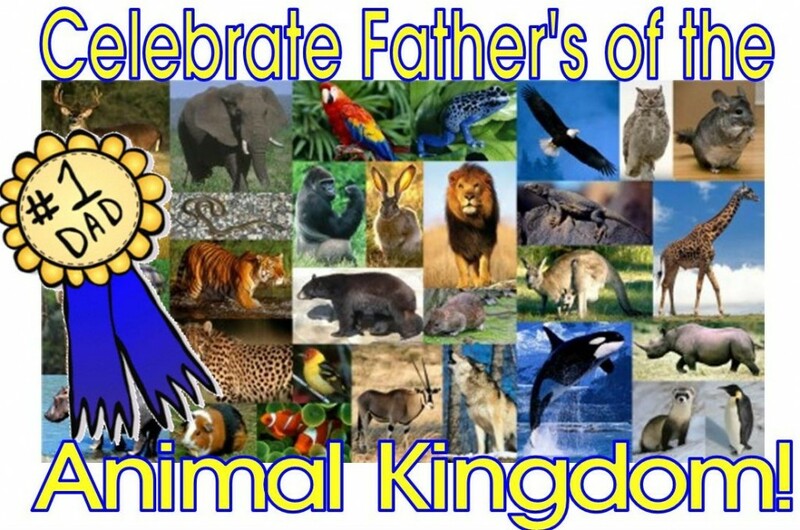 This magnificent father makes the list every year as king of — Animal Father’s Day. Although the females lay the eggs, it is up to the fathers to keep them warm for a full two months while the penguin mothers head out to sea to hunt for fish. These dedicated dads don’t even wander off for food. They huddle together in temperatures that can reach 70 degrees below zero and keep their eggs warm by resting them on top of their feet. When the chicks are hatched it’s dad who feeds them their first meal of a milky curd-like substance made from his body. Then, mom returns from hunting for fish and brings everyone in the family a real meal. Human fathers might pride themselves on being dedicated breadwinners, diligent carpool drivers or convenient camping buddies, but plenty of other dads in the natural world go above and beyond their average animal call of duty. No matter the species, this June we say Happy Father’s Day to all of the great dads who have inspired and enriched the children in their lives.